Why do you want this character? : Its not so much a matter of choosing, but the fact, that this is one of my favorite OCs in terms of shenanigans, personality, and the overall interactions he can have with certain characters. How often are you online? : Fridays and Saturdays are best, but I always try to pop on throughout the week. Cutie Mark: A Phoenix's Wing. Special Somepony: Single, but has developed a crush on a few mares. Residence: Cloudsdale though often heads south during winter. Workplace: Leader of a seldom seen flyer team called "Phoenix Wings," and trainer/caretaker for different breeds of Phoenix and primarily Fire based critters. Often assisting in the winter wrap-up due to his special traits. Short Introduction: That I am like a doting parent towards my friend(pet) Vortex, and have a very competitive aura about me, despite my kind and compassionate persona. 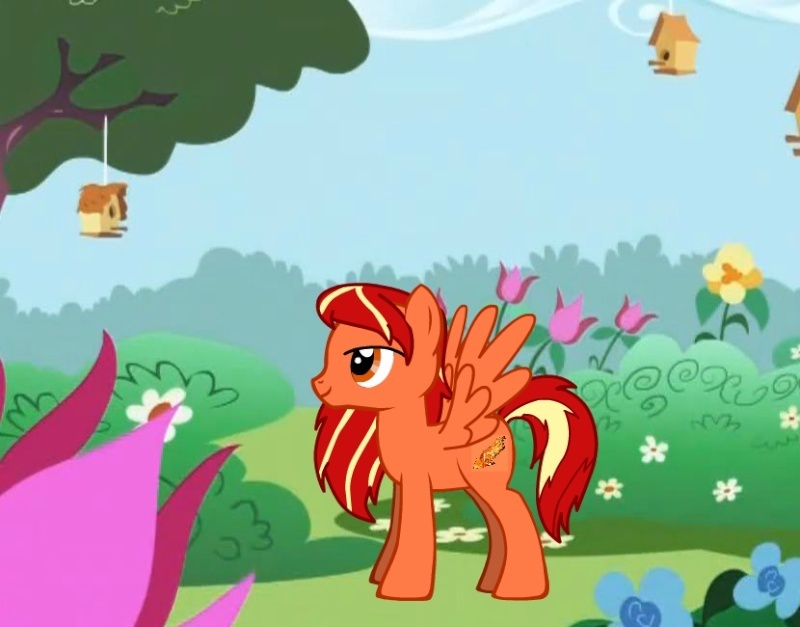 Backstory: My pony is a resident of Cloudsdale, who first took to the skies for the sake of a phoenix fledgling, Vortex. Growing up, he often played with his cousin, Spitfire, whom they shared a strong rivalry and friendship. At times saying seemingly hurtful things, to psych each other up. Overtime, he learned he had a natural gift much like his flame-wielding friend. When going at high speeds, his body will begin to heat up the air, at times igniting into a fiery-storm that blazes through the sky. (think Human Torch Pony) He created his team with two other pegasi with a gift similar to his own. Chillwind, and Ragnarok, though they rarely get together for any formal events. With Vortex as his motivation, he'd open a phoenix sanctuary near Cloudsdale, taking care of a number of different elemental Phoenixes, along with a few other element-blessed creatures. Seldom he'll go to ponyville, enlisting volunteers and interns, who wish to learn about and love phoenixes. Apearance: He is slightly above average height stallion, of an orange furred complexion. His eyes are a honey-like orange. Mane and tail are long and tri-colored, varying from a Scarlet Red, to a sunset-orange, to a bright sun-yellow. Often billows about behind him like a roaring flame during flight. Personality: Kind and caring, he'll race through a burning building(possibly enjoying it even) to make a sad friend or even stranger smile. He has a bit of duality to him though, getting highly competitive, especially if he's against his cousin in a game. A very doting and model pony for fatherhood should he ever find a mare, as he takes care of his many feathery elemental friends. Is sadly a bit of a romantic, and tends to fall head over heels for a kind, demure, or shy personality. Job: He's the leader and founder of the Phoenix Wings, a group of ponies with a strange affinity for one of the base elements of nature. This group is more for charity-endorsing than professional competition like his cousin's team, so is seldom seen. As the owner of Warm-Hearts, he shows his love and passion and expert, maybe masterful knowledge of phoenixes to new heights, and enjoying the company of any pony who is interested in such knowledge, or simply holds the same compassion. » Review on set 8037 Anakin's y-wing. » RC 049 flying wing plan???? ?